"Goldberg: What do you call “curated diversity”? Hannah-Jones: I never talk about school inequality in terms of “diversity” because I think it’s a useless word. I think it’s a word that white people love. When I say “curated diversity,” it means white parents like a type of diversity so they’ll still be the majority and there won’t be too many black kids. White Americans, in general, are willing to accept about the ratio of black Americans at large: 10 to 15 percent. Hannah-Jones: When you get into the 20s, white folks start to exaggerate how large the percentage is. So in New York City, one of the most segregated school systems in the country, if you’re a white parent in the public schools, you don’t want all-white schools. Goldberg: Because you’re a liberal? Hannah-Jones: Yeah. But what you want is a majority-white school with a small number of black kids and a good number of Latino, a good number of Asian. That makes you feel very good about yourself because you feel like your child is getting this beautiful integrated experience. The problem is that the public schools in New York City are 70 percent black and Latino. So, for you to have your beautiful diversity, that means that most black and Latino kids get absolutely none. The tolerance for increasing particularly the percentage of black kids is very low, and even lower if those black kids are poor. No white parents in New York City mind having my kid in their school because they feel like I’m on their level. But if you get too many of kids like mine who are black but poor, there’s very little tolerance." What I'm finding is that in many cities, especially in Chicago where I am, there's a real desire to curate the diversity of the city. And the result is that it leads to widely varying views on actual diversity, and ultimately on economic and social inequality and mobility. In Chicago, as in many cities, you'd never find a geographic unit of any type that had the kind of demographic breakdown seen above. Most census tracts, neighborhoods, community areas, zip codes -- whatever unit of geography -- are overwhelmingly one group or another. 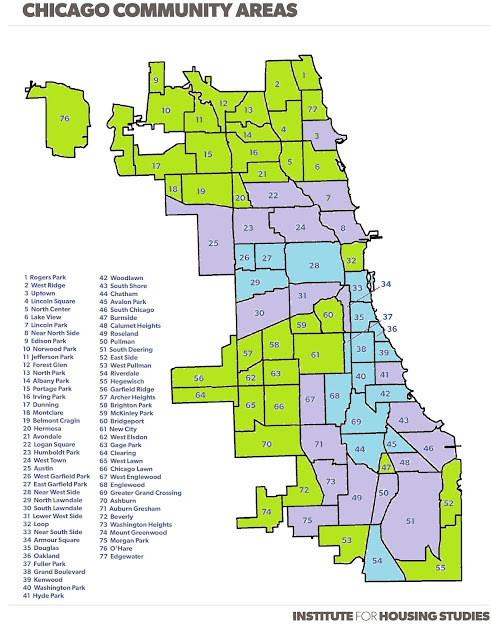 My guess is that many readers look at this and see the loss of green areas and the increase in purple areas and interpret the change as progress; a more integrated Chicago. Indeed, in 1970, 39 of Chicago's 77 CCAs had a white population in excess of 80 percent. Twenty-one CCAs fell into the middle category (20%-80% white), and 17 had minority populations in excess of 80 percent. In 2015 only four CCAs had a white population greater than 80 percent, and 30 had white populations between 20 and 80 percent. But just as noteworthy is the spread of blue on the 2015 map, indicative of the growth in the number of CCAs with minority populations greater than 80 percent. There were 17 in 1970 and 43 in 2015. And that's where the notion of "curated diversity" comes in. Chicago's North Side CCAs are more diverse than they've ever been. The North Side CCA of Lincoln Square (#4 on the map) was 94 percent white in 1970; in 2015 it was 65 percent. Irving Park, #16 on the map, was 96 percent white in 1970, and 40 percent in 2015. To the extent that those communities have become open to minorities, it is progress. There are many Chicagoans who are committed to, and just as importantly feel, that Chicago is a more tolerant and welcoming city. By contrast, Chicago's West Side and South Side CCAs are nearly as segregated as they've always been. The Grand Boulevard community (#38 above), was 99 percent black in 1970. By 2015 it was 91 percent. Woodlawn's black population in 1970 was 96 percent; in 2015 it was 85 percent. Moderate changes, yes. But it's clear that "diversity" is happening in the places where it's being curated. How is this accomplished? It appears it's a matter of moving the goalposts in for many former supermajority white neighborhoods. In other words, Chicago neighborhoods that previously had overwhelmingly large white populations have been traded in for one that have a simple majority or plurality. There are neighborhoods that have indeed welcomed in greater numbers of minorities, particularly the rapidly growing Latino and Asian segments of the population. It's somewhat less true for African-Americans in Chicago, but there has indeed been a significant increase in the number of African-Americans in former supermajority white neighborhoods. However, there's been little corresponding movement into supermajority minority neighborhoods, particularly supermajority African-American neighborhoods. What remains is a Chicago that, despite dramatic increases in the numbers of Latino and Asian residents, consistent numbers of African-American residents over time, and a substantial loss of white residents, is virtually as segregated today as it was nearly 50 years ago. Why does this matter? Where we live vastly impacts our perceptions of how we live. It sets the stage for huge differences in how we view our schools, our police protection, how infrastructure investment decisions are made. It reinforces deep divides within a shared space. "I hear this all the time: “You can’t integrate schools in York City because there’s not enough white kids.” But that's only based on the premise that you can’t expect white kids to be in the minority. The demographics of the New York City public schools are about 40 percent Latino, almost 30 percent black, 15 percent Asian, 15 percent white. If you picture a classroom like that, that's a beautiful school. That’s a beautifully diverse, integrated school. You could have that if you chose. We just don’t choose it, because we automatically say, “You can’t expect that a white parent will put their kid in school with all those black kids.”"
"We have a system where white people control the outcomes. And the outcome that most white Americans want is segregation. And I don’t mean the type of segregation that we saw in 1955. I don't mean complete segregation. I don't think there are very many white Americans who want entirely white schools. What they do want is a limited number of black kids in their schools." The rigid lines of segregation have softened somewhat, but there's still quite a way to go. This piece originally appeared on The Corner Side Yard. Pete Saunders is a Detroit native who has worked as a public and private sector urban planner in the Chicago area for more than twenty years. He is also the author of "The Corner Side Yard," an urban planning blog that focuses on the redevelopment and revitalization of Rust Belt cities. Submitted by qet on Wed, 10/10/2018 - 08:17. This matter rarely, if ever, is treated in an intellectually honest manner. No doubt white people feel less comfortable being a minority or a too-slim majority. But the attribution of the impulse to segregation exclusively to white people is fraudulent. Pay attention and you will discover that blacks and Latinos have no great desire to associate with white people. For them, white people are something to be endured, to be put up with. No black parent ever seeks admission of her child to a majority white school in order that her child may benefit from being in the presence of white people. 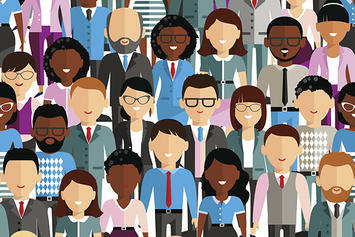 Diversity, curated or not, is a one-way street: it is believed necessary that white people must be associated with racial minorities in order to benefit white people, never that blacks and Latinos will benefit from being in the presence of white people. The white schools tend to be better schools--better teachers, better facilities--and so aspiring black and Latino students naturally desire entrance to them. I have never read a single black or Latino writer who has urged the associative aspect of diversity as a good for blacks or Latinos. Not one. Diversity is rather intended as a remedy for what ails white people--racism, which is held to be an exclusively white affliction. And also a means by which to open the superior schools to blacks and Latinos (and only them, as we see with the Asian student phenomenon; black writers are increasingly mentally categorizing Asians as Whites for these purposes). Fortunately (or not), recent years have seen the progressive abandonment of the doubletalk that blacks and Latinos have felt it necessary to engage in as they sought economic advantage under the anodyne of "diversity." Now they feel much more free to openly declare their hostility and even hatred of white people generally, revealing that word for the sham it became. Blacks and Latinos actively self-segregate from whites whenever they can. This is simply a fact. The only justification for it is that blacks and Latinos are righteous in their exclusion but whites aren't. OK. We can certainly consider and debate that. But the facts must nevertheless be faced.